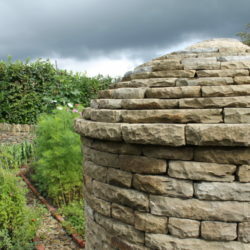 The South Pennine Walling Company is based around the traditional craft of Dry Stone Walling with a strong emphasis on dry stone masonry techniques as applied to garden, landscape and architecture. DSWA Master craftsman Richard Meller works with a small highly skilled team and can be contacted directly. Dry Stone Features. Walls. Garden Landscapes. Restoration. Structures. Cladding. Steps. Tables. Sculpture. Letter Carving.